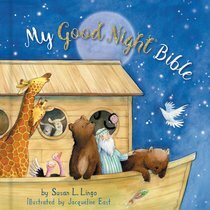 These bedtime Bible stories were written to help bring restful closure to a child's day. This delightful book includes 45 Bible story favorites with soft yet colorful new art. Each story includes a Bible verse, a prayer time, and a Bible word to help teach children about prayer and biblical concepts. About "My Good Night Bible (Padded)"